Apparently, they'll make a movie about damn near anyone these days. 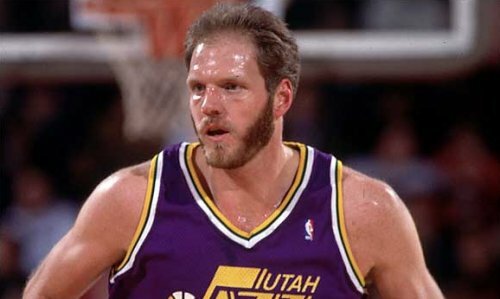 The latest athlete to get the big screen treatment is spectacularly-bearded former Jazz center Mark Eaton. Eaton will be the subject of a film by Stacy Dymalski that will probably not be entitled, "What's Eatin' Mark Eaton?" The Ryan Leaf Movie Will Probably Be Just Like "Brian&apos;s Song"
Eaten had some internal conflict on his way to the NBA; growing up ashamed of his own height. He played water polo as a child, eventually did get around to basketball in high school, but couldn't get off the bench. He had a brief career as an auto mechanic before UCLA gave him a scholarship to once again sit on the bench. The Jazz ended up spending a 4th round pick on him, and he went on to become the shot-blocking force that we all know, love, and still have posters of in our bedrooms. "The greatest thing I see is how basketball allowed him to smile and be happy with himself. Everything that has happened was supposed to happen. That's how I feel. It's just beautiful."